Article Contributed By: Lauren N. Hardy, MA – Athlete’s Recovery Clinical Team Member. Site Description: Athlete’s Recovery is a leader in providing elite treatment for collegiate and professional athletes, both active and retired, who are struggling with addictions and mental health concerns. By implementing cutting-edge concepts, we provide a sports-like team environment that provides our athletes with the trust and safety required to successfully foster a healthy recovery process. The rush of competition is something that many athletes have described as being addicting. The feeling of being watched, respected, and sometimes even idolized, can be intoxicating. However, along with a fierce sense of competition comes the development of high standards. Whether those high standards are set by coaches, teammates, parents, fans, oneself, or a combination of all, they will undoubtedly cause some athletes to become overly critical of themselves. They may begin to obsess about minor mistakes that they make. They may begin to fear rejection and dissatisfaction from their coaches or teammates. They may become worried about letting their fans down. But, most importantly, there may exist an inherent fear of complete failure. When the minds of athletes become consumed with these kinds of negative recurring thoughts, they may begin to base their own self-worth on their ability to perform. As this pressure increases, the more quickly athletes may find themselves suffering from feelings of burn-out; of just wanting to walk away from it all . Then they convince themselves that walking away is not an option. So, in order to rid themselves of those feelings of being burnt out, and in order to put their fears of failure at rest, some athletes turn to the comfort of abusing substances. 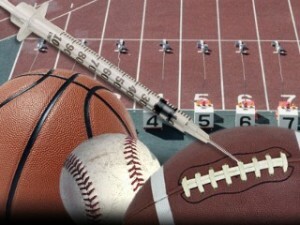 Some substance abuse amongst athletes can begin innocently. As injuries commonly occur in every type of sport, so does the need for medication in order to help ease the pain caused by those injuries. The longer that athletes take these painkillers, the more quickly their tolerance develops, leaving them to require greater amounts in order to continuously feel those same euphoric feelings and that same greater sense of self-worth. Other substances like relaxants (such as alcohol and beta-blockers) and diuretics can also become abused by athletes. Athletes whose sport requires them to maintain a certain weight may use diuretics in order to help ease the stress of doing so. Other athletes may find that, because they are constantly flooded with thoughts of needing to excel, the only way that they can ease their minds is by using some form of relaxant. The expectations that athletes face can be overwhelming, but treatment can help them find ways of coping without needing to use substances. Bio: “How the Pressure to Excel in Athletics Can Lead to Substance Abuse” was written by Athlete’s Recovery clinical team member Lauren Hardy, M.A. Lauren has several years of experience in the treatment field as a research analyst at Vanderbilt University and has her Master’s Degree in Counseling Psychology.